Australia and the UK are “are in the process of concluding negotiations on fintech” that will lead to greater cooperation between the countries in this fast-growing sector, the Australian High Commissioner to the UK disclosed at a conference last week. Alexander Downer, formerly Australia’s longest-serving foreign minster with a tenure of 16 years, pictured left, made the comments at City & Financial Global’s trade conference, where he also urged the UK to be more “ambitious and optimistic” about its post-Brexit future. Fintech is the rising star of the UK’s financial services industry, with more than US$1bn (£760m) invested by venture capitalists in 2017 to date. Downer said that the result of that agreement, he hoped, will be the enhancement of cooperation between the two jurisdiction’s respective regulatory authorities. An HM Treasury spokesperson confirmed the negotiations to International Investment, saying “The UK and Australia are currently working on the creation of a fintech bridge to increase links in FinTech trade and investment between both markets,” adding that the bridge agreement was currently being prepared and would be signed in due course. 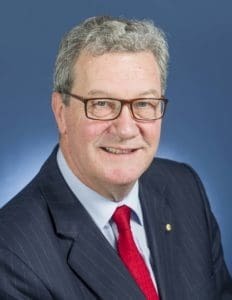 In a wide-ranging discussion, Downer, who has something of a reputation for no-nonsense straight-talking, held out the fintech bridge agreement as an example of the type of free-trade agreements that the UK would be able to sign with countries around the world after Brexit takes place. He urged international trade secretary Liam Fox to look to developing agreements with Australia and New Zealand, “countries which are very like-minded and have similar sorts of institutions, in particular legal institutions, and have the same sort of approach to economic policy”. Beyond those countries, he advised Fox to look to countries such as the United States, China and Japan. He showed himself to be a champion of the liberal market economy and deeply opposed to the sort of protectionism that he associates with the EU. He said that Australia was looking for an improvement in the relationship that it has with the UK. “This assumption that other countries won’t want to do this with the UK and won’t want to do that with the UK, you know, the usual sort of doom-sayer stories about how the sky is going to fall in when you leave the EU, that presupposes that other countries are all lining up to have a shot at you. To read more about the High Commissioner’s thought-provoking views on life after Brexit, click here.